Now released for forward thinking coaches! 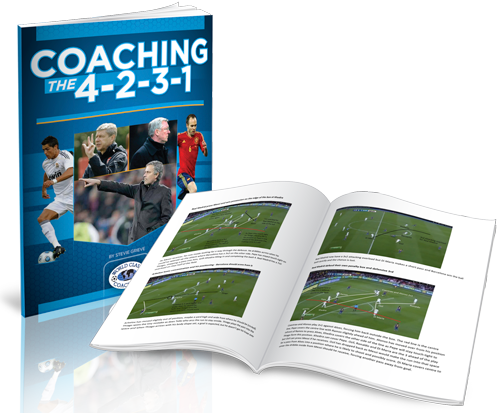 NEW BOOK –Coaching the 4-2-3-1 shows you why the formation is becoming one of the most dominant styles of play in modern soccer. Now you can discover how to train your players to utilize this highly flexible and attacking formation in Coaching the 4-2-3-1. Packed with soccer drills, diagrams on setting up your team and guidance on the formation’s philosophy and playing mindset, this book provides you with everything you need to know about playing the 4-2-3-1. Grieve then made the move abroad to Intersoccer in Switzerland, where he was the head coach of, the Swiss team FC Gland 3. Currently Grieve is the Head of Coach of Education for Bhaichung Bhutia Football Schools, in India, where he is responsible for the development of over 60 coaches across India, designing and implementing a new coaching curriculum and helping with the development of elite players within the development structure. Grieve has written various books, including Modern Soccer Tactics 1 & 2, Winning Soccer Tactics, and has passed various coaching courses, including a FIFA Advanced Futsal Diploma, Scottish FA ‘B’ Licence for Youths Coaching and has recently passed his Scottish FA ‘A’ Licence for Children’s Coaching. Coaching the 4-2-3-1 opens with a guide on how elite coaches, like Vincent Del Bosque andJose Mourinho, utilize the formation. It then provides a series of chapters packed with soccer drills to coach your players in the mindset and positional awareness needed to play the dynamic and fluid 4-2-3-1 formation effectively.